Logarithms to Base 10 were used extensively for calculation up until the calculator was adopted in the 1970s and 80s. The concept of logarithms is still very important in many fields of science and engineering. One example is acoustics. Our calculators allow us to use logarithms to base 10. 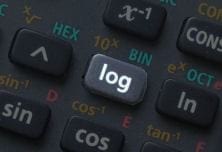 These are called common logarithms ("log" on a calculator). We normally do not include the 10 when we write logarithms to base 10.
log x to mean log10 x. 1. Find the logarithm of `5 623` to base `10`. Write this in exponential form. Mental check: `10^3 = 1,000` and `10^4 = 10,000`. Our number `5623` is between these values, so it's at least reasonable. 2. Find the antilogarithm of `-6.9788`. This means "if `log N = -6.9788`, what is `N`?" Using the logarithm laws, `N = 10^-6.9788 = 0.000 000 105`.